Today installed yahoo widgets, its looks same as Google desktop along with gadgets but the difference is no internal search or indexing as google does. Yahoo widget engine has to be installed first and then download the widget which you need show up on the desktop. Glossy look of the widgets makes the desktop appearance fancy. Some features like Headsup display (F8 hotkey) makes the widgets configurable when its set as floating. 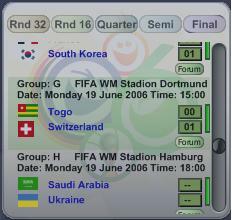 Some Widgets i'm using now,WorldCupFixture,Digital Clock,Smarter_Stickies,Picture Frame And we can download Yahoo! Widgets SDK, to script some widgets ourselves. Currently im scribbling something to read the thatstamil.com RSS feed. Download the engine and the widgets from http://widgets.yahoo.com.